Bed & Breakfast Rome, Italy - Reservation guide of Accommodations and Bed & Breakfast in Rome, Italy. Hotels with parking in Rome ? If you have decided to travel to Rome by car or motorbike, don't worry about finding a parking space or leaving your vehicle unattended. Display the list of hotels and accomodation in Rome provided with a parking place or a garage. Book a hotel in Rome with a parking area! Pet-friendly hotels in Rome ? Don't leave your dog at home. Use our guide to check the list of hotels and accomodation that welcome dogs in Rome. It is also possible, from our selected list of hotels and accomodation where animals are allowed in Rome, to keep your dog in the room with you! Hotel rooms for disabled guests in Rome ? Check our offers of hotels and accomodation in Rome with rooms equipped for the disabled! For your stay in Rome, book a hotel accessible to disabled people. Choose your hotel in Rome from the list of hotels equipped to welcome disabled people! Wi-Fi hotels in Rome ? Are you looking for a hotel or accomodation with a quick internet access and wi.fi? Click on the list of hotels in Rome which have a wireless connection to internet and wi.fi. Gay-friendly hotels in Rome ? Look for gay friendly hotels or gay friendly accomodation in Rome, choose to sleep in a gay friendly hotel or gay friendly accomodation in Rome! 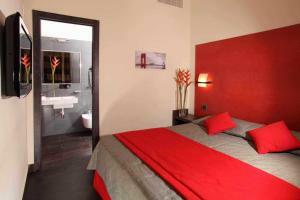 Take advantage of our offers of gay friendly hotels or gay friendly accomodation to book your holidays in Rome.